Cluster OS Rolling Upgrade enables an administrator to upgrade the operating system of the cluster nodes without stopping the Hyper-V or the Scale-Out File Server workloads. Using this feature, the downtime penalties against Service Level Agreements (SLA) can be avoided. Failover clusters running Hyper-V virtual machine and Scale-out File Server (SOFS) workloads can be upgraded from Windows Server 2012 R2 (running on all nodes in the cluster) to Windows Server 2016 (running on all cluster nodes of the cluster) without downtime. Other cluster workloads, such as SQL Server, will be unavailable during the time (typically less than five minutes) it takes to failover to Windows Server 2016. It doesn't require any additional hardware. Although, you can add additional cluster nodes temporarily to small clusters to improve availability of the cluster during the Cluster OS Rolling Upgrade process. The cluster doesn't need to be stopped or restarted. A new cluster is not required. The existing cluster is upgraded. In addition, existing cluster objects stored in Active Directory are used. The upgrade process is reversible until the customer choses the "point-of-no-return", when all cluster nodes are running Windows Server 2016, and when the Update-ClusterFunctionalLevel PowerShell cmdlet is run. A value of 8 indicates that the cluster is running at the Windows Server 2012 R2 functional level. A value of 9 indicates that the cluster is running at the Windows Server 2016 functional level. Cluster OS Rolling Upgrade is fully supported by System Center Virtual Machine Manager (SCVMM) 2016. If you are using SCVMM 2016, see Perform a rolling upgrade of a Hyper-V host cluster to Windows Server 2016 in VMM for guidance on upgrading the clusters and automating the steps that are described in this document. Start with a Failover Cluster running Windows Server (Semi-Annual Channel), Windows Server 2016, or Windows Server 2012 R2. Upgrading a Storage Spaces Direct cluster to Windows Server, version 1709 isn't supported. If the cluster workload is Hyper-V VMs, or Scale-Out File Server, you can expect zero-downtime upgrade. Download the Coreinfo v3.31 tool to determine if a CPU supports SLAT. This section describes the various transition states of the Windows Server 2012 R2 cluster that is being upgraded to Windows Server 2016 using Cluster OS Rolling Upgrade. In order to keep the cluster workloads running during the Cluster OS Rolling Upgrade process, moving a cluster workload from a Windows Server 2012 R2 node to Windows Server 2016 node works as if both nodes were running the Windows Server 2012 R2 operating system. When Windows Server 2016 nodes are added to the cluster, they operate in a Windows Server 2012 R2 compatibility mode. A new conceptual cluster mode, called "mixed-OS mode", allows nodes of different versions to exist in the same cluster (see Figure 1). A Windows Server 2012 R2 cluster enters mixed-OS mode when a Windows Server 2016 node is added to the cluster. The process is fully reversible - Windows Server 2016 nodes can be removed from the cluster and Windows Server 2012 R2 nodes can be added to the cluster in this mode. The "point of no return" occurs when the Update-ClusterFunctionalLevel PowerShell cmdlet is run on the cluster. In order for this cmdlet to succeed, all nodes must be Windows Server 2016, and all nodes must be online. This section illustrates and describes the four different stages of a cluster with shared storage whose nodes are upgraded from Windows Server 2012 R2 to Windows Server 2016. "Stage 1" is the initial state - we start with a Windows Server 2012 R2 cluster. In "Stage 2", two nodes have been paused, drained, evicted, reformatted, and installed with Windows Server 2016. At "Stage 3", all of the nodes in the cluster have been upgraded to Windows Server 2016, and the cluster is ready to be upgraded with Update-ClusterFunctionalLevel PowerShell cmdlet. At this stage, the process can be fully reversed, and Windows Server 2012 R2 nodes can be added to this cluster. After the Update-ClusterFunctionalLevelcmdlet is run, the cluster enters "Stage 4", where new Windows Server 2016 cluster features can be used. This section describes the workflow for performing Cluster OS Rolling Upgrade. Cluster OS Rolling Upgrade requires removing one node at a time from the cluster. Check if you have sufficient capacity on the cluster to maintain HA SLAs when one of the cluster nodes is removed from the cluster for an operating system upgrade. In other words, do you require the capability to failover workloads to another node when one node is removed from the cluster during the process of Cluster OS Rolling Upgrade? Does the cluster have the capacity to run the required workloads when one node is removed from the cluster for Cluster OS Rolling Upgrade? For Hyper-V workloads, check that all Windows Server 2016 Hyper-V hosts have CPU support Second-Level Address Table (SLAT). Only SLAT-capable machines can use the Hyper-V role in Windows Server 2016. Check that any workload backups have completed, and consider backing-up the cluster. Stop backup operations while adding nodes to the cluster. Check that all cluster nodes are online /running/up using the Get-ClusterNode cmdlet (see Figure 7). If you are running Cluster Aware Updates (CAU), verify if CAU is currently running by using the Cluster-Aware Updating UI, or the Get-CauRun cmdlet (see Figure 8). Stop CAU using the Disable-CauClusterRole cmdlet (see Figure 9) to prevent any nodes from being paused and drained by CAU during the Cluster OS Rolling Upgrade process. Using Cluster Manager UI, select a node and use the Pause | Drain menu option to drain the node (see Figure 10) or use the Suspend-ClusterNode cmdlet (see Figure 11). Using Cluster Manager UI, Evict the paused node from cluster, or use the Remove-ClusterNode cmdlet. 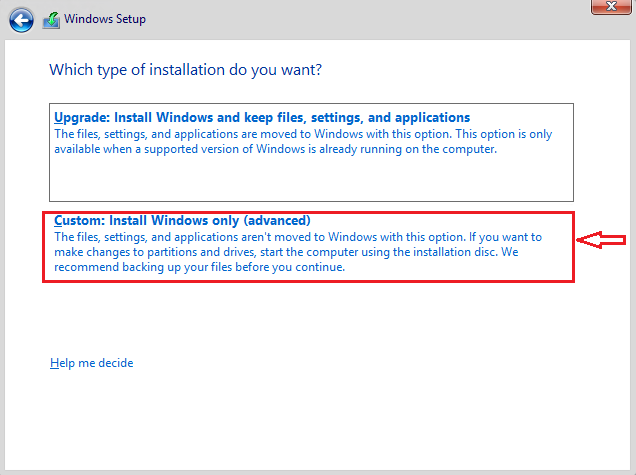 Reformat the system drive and perform a "clean operating system install" of Windows Server 2016 on the node using the Custom: Install Windows only (advanced) installation (See Figure 13) option in setup.exe. Avoid selecting the Upgrade: Install Windows and keep files, settings, and applications option since Cluster OS Rolling Upgrade doesn't encourage in-place upgrade. Add the node to the appropriate Active Directory domain. Add the appropriate users to the Administrators group. Using the Server Manager UI or Install-WindowsFeature PowerShell cmdlet, install any server roles that you need, such as Hyper-V. Using the Server Manager UI or Install-WindowsFeature PowerShell cmdlet, install the Failover Clustering feature. Install any additional features needed by your cluster workloads. Check network and storage connectivity settings using the Failover Cluster Manager UI. If Windows Firewall is used, check that the Firewall settings are correct for the cluster. For example, Cluster Aware Updating (CAU) enabled clusters may require Firewall configuration. 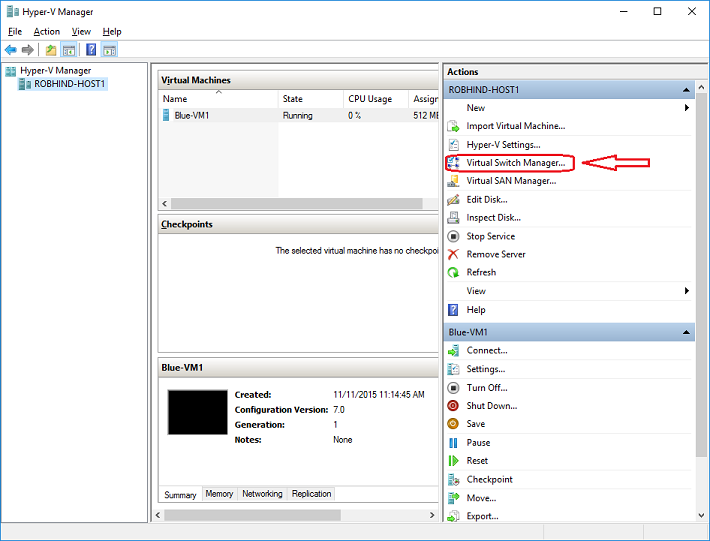 For Hyper-V workloads, use the Hyper-V Manger UI to launch the Virtual Switch Manager dialog (see Figure 14). Check that the name of the Virtual Switch(s) used are identical for all Hyper-V host nodes in the cluster. 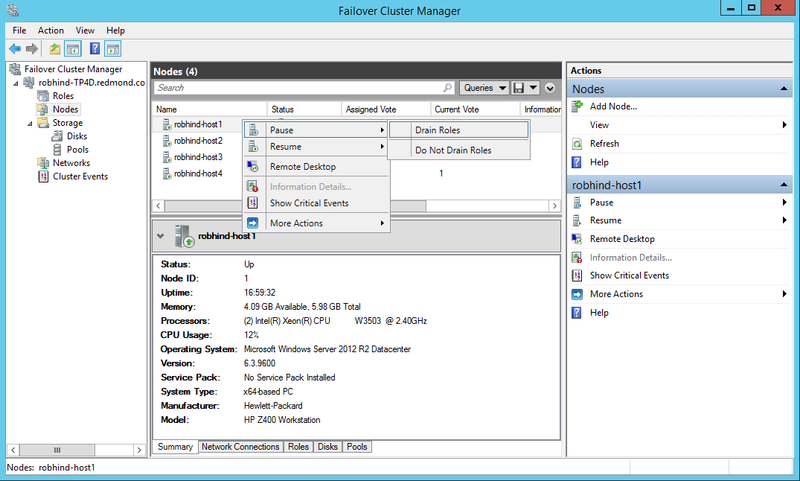 On a Windows Server 2016 node (do not use a Windows Server 2012 R2 node), use the Failover Cluster Manager (see Figure 15) to connect to the cluster. Use either the Failover Cluster Manager UI or the Add-ClusterNode cmdlet (see Figure 16) to add the node to the cluster. When the first Windows Server 2016 node joins the cluster, the cluster enters "Mixed-OS" mode, and the cluster core resources are moved to the Windows Server 2016 node. A "Mixed-OS" mode cluster is a fully functional cluster where the new nodes run in a compatibility mode with the old nodes. "Mixed-OS" mode is a transitory mode for the cluster. It is not intended to be permanent and customers are expected to update all nodes of their cluster within four weeks. Use Live Migration from the Failover Cluster Manager for virtual machines or the Move-ClusterVirtualMachineRole cmdlet (see Figure 17) to perform a live migration of the virtual machines. Use Move from the Failover Cluster Manager or the Move-ClusterGroup cmdlet for other cluster workloads. After you update the cluster functional level, you cannot go back to Windows Server 2012 R2 functional level and Windows Server 2012 R2 nodes cannot be added to the cluster. Until the Update-ClusterFunctionalLevel cmdlet is run, the process is fully reversible and Windows Server 2012 R2 nodes can be added to this cluster and Windows Server 2016 nodes can be removed. After the Update-ClusterFunctionalLevel cmdlet is run, new features will be available. Using the Failover Cluster Manager UI or the Get-ClusterGroup cmdlet, check that all cluster roles are running on the cluster as expected. In the following example, Available Storage is not being used, instead CSV is used, hence, Available Storage displays an Offline status (see Figure 18). Check that all cluster nodes are online and running using the Get-ClusterNode cmdlet. Run the Update-ClusterFunctionalLevel cmdlet - no errors should be returned (see Figure 19). After the Update-ClusterFunctionalLevel cmdlet is run, new features are available. If you were previously running CAU, restart it using the CAU UI or use the Enable-CauClusterRole cmdlet (see Figure 20). Enable and use the Windows Server 2016 features on Hyper-V Virtual Machines. On each Hyper-V host node in the cluster, use the Get-VMHostSupportedVersion cmdlet to view the Hyper-V VM configuration versions that are supported by the host. On each Hyper-V host node in the cluster, Hyper-V VM configuration versions can be upgraded by scheduling a brief maintenance window with users, backing up, turning off virtual machines, and running the Update-VMVersion cmdlet (see Figure 22). This will update the virtual machine version, and enable new Hyper-V features, eliminating the need for future Hyper-V Integration Component (IC) updates. This cmdlet can be run from the Hyper-V node that is hosting the VM, or the -ComputerName parameter can be used to update the VM Version remotely. In this example, here we upgrade the configuration version of VM1 from 5.0 to 7.0 to take advantage of many new Hyper-V features associated with this VM configuration version such as Production Checkpoints (Application Consistent backups), and binary VM configuration file. Storage pools can be upgraded using the Update-StoragePool PowerShell cmdlet - this is an online operation. Although we are targeting Private Cloud scenarios, specifically Hyper-V and Scale-out File Server clusters, which can be upgraded without downtime, the Cluster OS Rolling Upgrade process can be used for any cluster role. This feature works only for Windows Server 2012 R2 to Windows Server 2016 versions only. This feature cannot upgrade earlier versions of Windows Server such as Windows Server 2008, Windows Server 2008 R2, or Windows Server 2012 to Windows Server 2016. Each Windows Server 2016 node should be reformatted/new installation only. "In-place" or "upgrade" installation type is discouraged. A Windows Server 2016 node must be used to add Windows Server 2016 nodes to the cluster. When managing a mixed-OS mode cluster, always perform the management tasks from an uplevel node that is running Windows Server 2016. Downlevel Windows Server 2012 R2 nodes cannot use UI or management tools against Windows Server 2016. We encourage customers to move through the cluster upgrade process quickly because some cluster features are not optimized for mixed-OS mode. Avoid creating or resizing storage on Windows Server 2016 nodes while the cluster is running in mixed-OS mode because of possible incompatibilities on failover from a Windows Server 2016 node to down-level Windows Server 2012 R2 nodes. How long can the failover cluster run in mixed-OS mode? We encourage customers to complete the upgrade within four weeks. There are many optimizations in Windows Server 2016. We have successfully upgraded Hyper-V and Scale-out File Server clusters with zero downtime in less than four hours total. Will you port this feature back to Windows Server 2012, Windows Server 2008 R2, or Windows Server 2008? We do not have any plans to port this feature back to previous versions. Cluster OS Rolling Upgrade is our vision for upgrading Windows Server 2012 R2 clusters to Windows Server 2016 and beyond. Does the Windows Server 2012 R2 cluster need to have all the software updates installed before starting the Cluster OS Rolling Upgrade process? Yes, before starting the Cluster OS Rolling Upgrade process, verify that all cluster nodes are updated with the latest software updates. Can I run the Update-ClusterFunctionalLevel cmdlet while nodes are Off or Paused? No. All cluster nodes must be on and in active membership for the Update-ClusterFunctionalLevel cmdlet to work. Does Cluster OS Rolling Upgrade work for any cluster workload? Does it work for SQL Server? Yes, Cluster OS Rolling Upgrade works for any cluster workload. However, it is only zero-downtime for Hyper-V and Scale-out File Server clusters. Most other workloads incur some downtime (typically a couple of minutes) when they failover, and failover is required at least once during the Cluster OS Rolling Upgrade process. Can I automate this process using PowerShell? Yes, we have designed Cluster OS Rolling Upgrade to be automated using PowerShell. For a large cluster that has extra workload and failover capacity, can I upgrade multiple nodes simultaneously? Yes. When one node is removed from the cluster to upgrade the OS, the cluster will have one less node for failover, hence will have a reduced failover capacity. For large clusters with enough workload and failover capacity, multiple nodes can be upgraded simultaneously. You can temporarily add cluster nodes to the cluster to provide improved workload and failover capacity during the Cluster OS Rolling Upgrade process. What if I discover an issue in my cluster after Update-ClusterFunctionalLevel has been run successfully? If you have backed-up the cluster database with a System State backup before running Update-ClusterFunctionalLevel, you should be able to perform an Authoritative restore on a Windows Server 2012 R2 cluster node and restore the original cluster database and configuration. Can I use in-place upgrade for each node instead of using clean-OS install by reformatting the system drive? We do not encourage the use of in-place upgrade of Windows Server, but we are aware that it works in some cases where default drivers are used. Please carefully read all warning messages displayed during in-place upgrade of a cluster node. If I am using Hyper-V replication for a Hyper-V VM on my Hyper-V cluster, will replication remain intact during and after the Cluster OS Rolling Upgrade process? Yes, Hyper-V replica remains intact during and after the Cluster OS Rolling Upgrade process. Can I use System Center 2016 Virtual Machine Manager (SCVMM) to automate the Cluster OS Rolling Upgrade process? 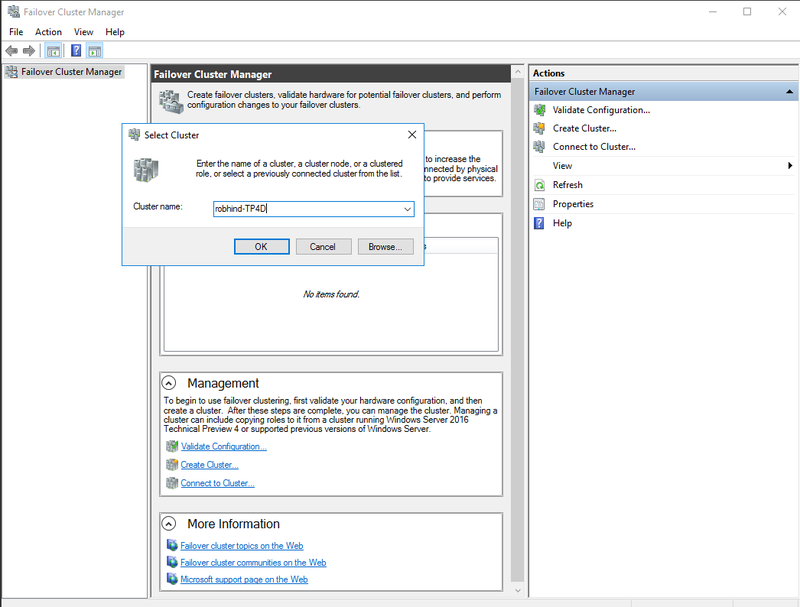 Yes, you can automate the Cluster OS Rolling Upgrade process using VMM in System Center 2016.